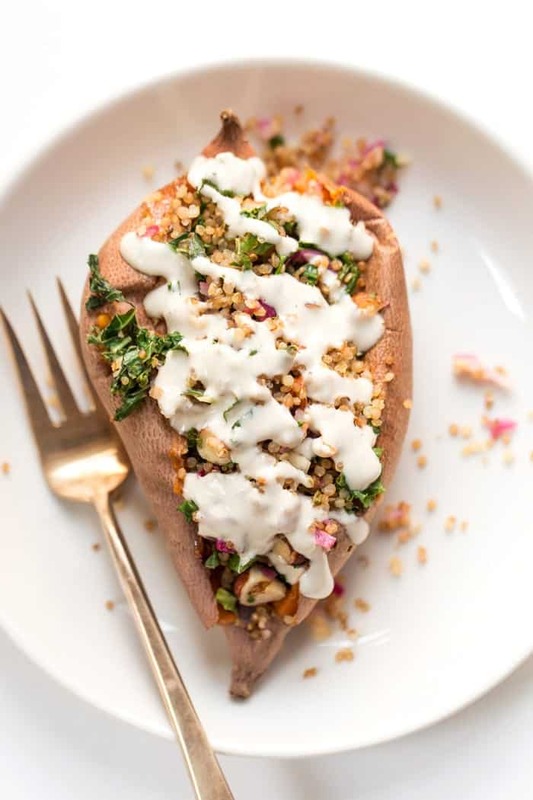 These Quinoa Stuffed Sweet Potatoes are filled with quinoa, kale, hazelnuts and topped with a creamy tahini dressing. 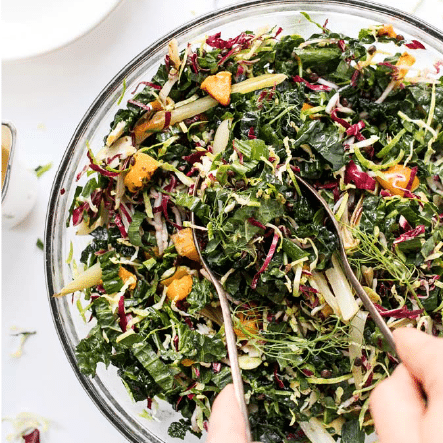 Makes for a hearty main or side dish! As I was searching for something to make for dinner last night, I decided to forgo my usual scroll through Pinterest and turn to my own archives. 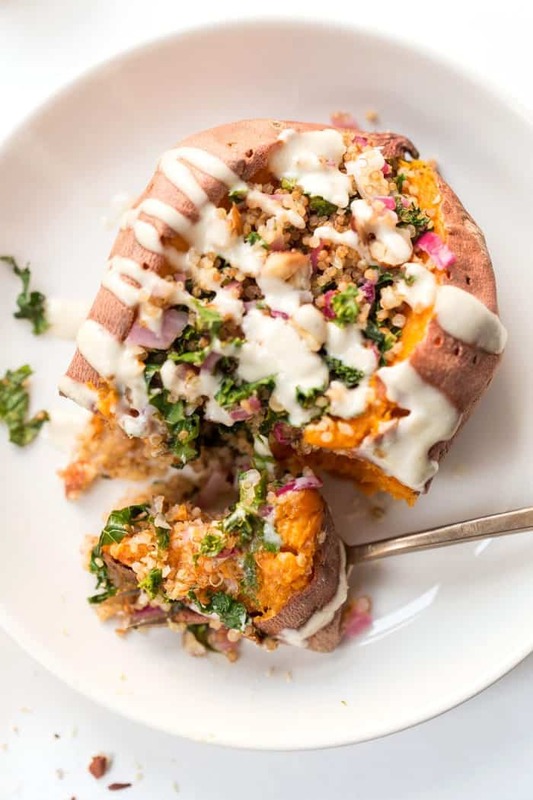 There are so many good recipes there that just seem to get lost in the shuffle and when I stumbled upon these Quinoa Stuffed Sweet Potatoes, I felt like I hit the jackpot. I couldn't really remember making the recipe, but I remember feeling super proud of the photos at the time. But now looking back, they definitely needed a little updating. I will say though, seeing the progress in my own journey is super fun! So rather than recreate the entire recipe from scratch, which is often what I do (even with other people's recipes…something Matt can't stand about me hehe 😉), I cooked it as is and made just one small tweak. You know me! I can't seem to make a meal without my greens! And honestly, they were perfection. I was actually a little surprised with myself! Soft, sweet, tender, perfectly roasted potatoes, filled with a nutty, lemony quinoa mixture 👌🏻 It was cozy, comforting, hearty and everything that my body was craving at that very minute. 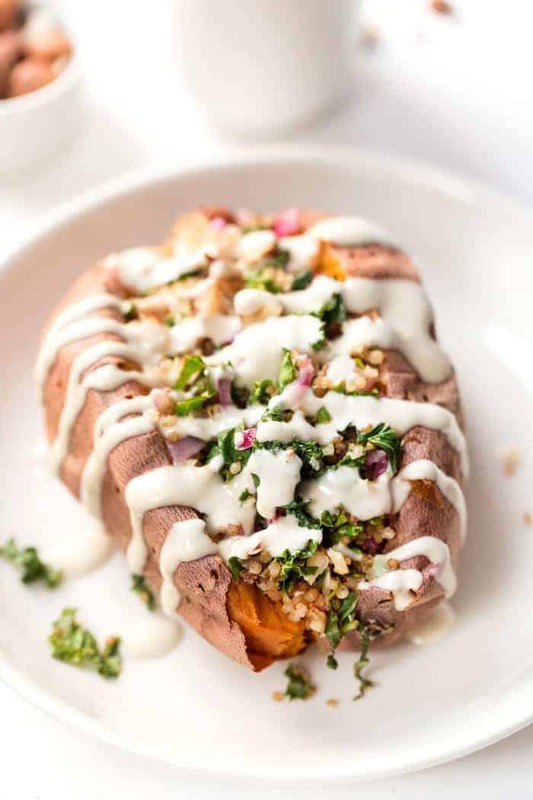 In my view, these quinoa stuffed sweet potatoes are the epitome of a perfect winter meal. And mostly because of the sweet potatoes. 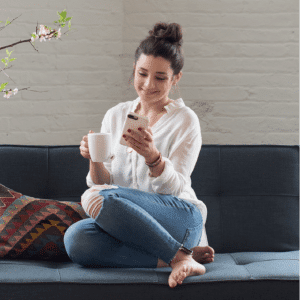 So let's talk them, shall we? Sweet potatoes are a sensational ingredient and a must-have in my winter meals. They're sweet, packed with nutrients and insanely good for you. 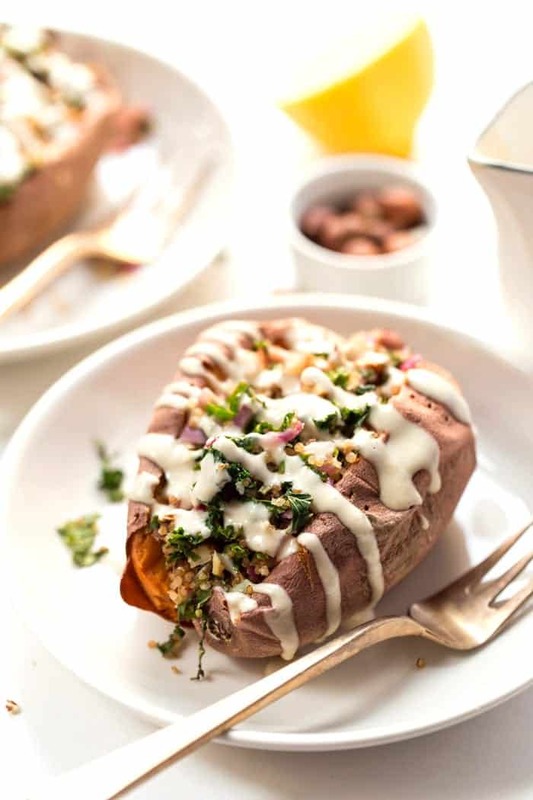 Just to name a few of the benefits, sweet potatoes are loaded with Vitamin C, which we all know helps keep our immune system strong (which is especially important as cold and flu season is now upon us). They are also filled with Vitamin D which is critical to our immune health but also boosts our energy levels and our moods. A food that makes you happy? Can't get much better than that! And of course, to finish the whole dish off, we needed something creamy. I went with a classic: lemon, tahini and water. It's my go-to combo for…well pretty much everything and it definitely didn't fail this time around. It gave the potatoes a little extra tang and really helped to give the quinoa mixture some extra creaminess. It pulled it all together and was the perfect end to what has now become one of my favorite wintertime meals. 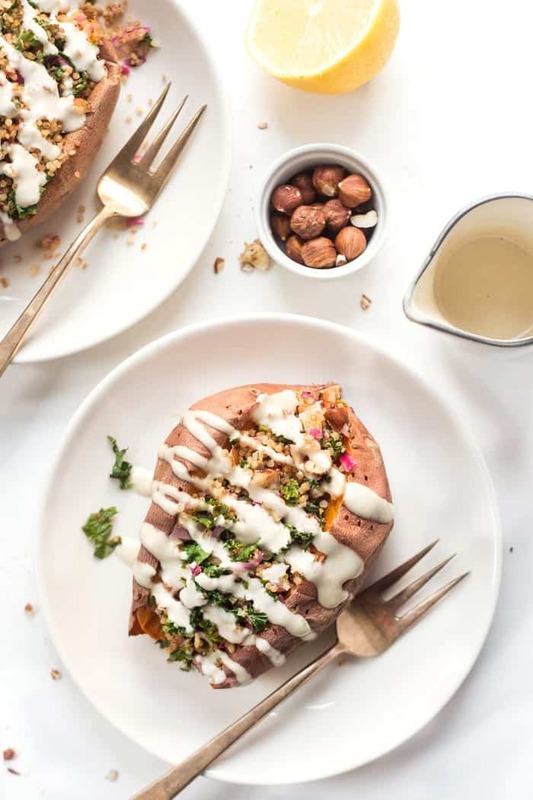 So yes friends, these Quinoa Stuffed Sweet Potatoes were a beyond perfect meal. They're keeping me healthy, they're making me happy, they're fueling my body with protein, carbs and tons of nutrients, and leaving my tummy feeling oh-so content. Preheat the oven to 400ºF. 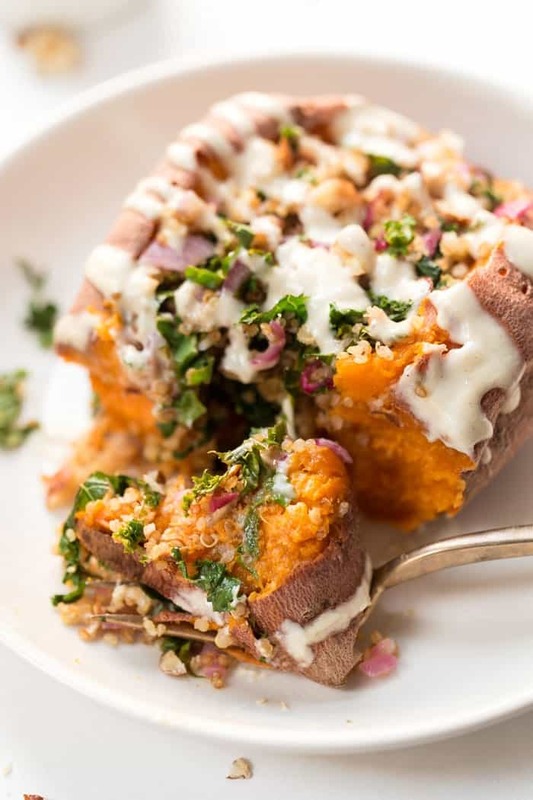 Puncture the sweet potatoes with a fork and place them in a baking dish. 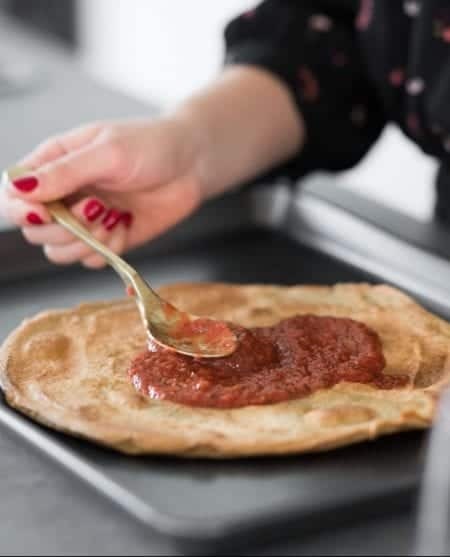 Bake until soft, and knife slides into the flesh easily, about 35 – 45 minutes depending on the size. Meanwhile, prepare the quinoa mixture by heating the oil in a saute pan over medium heat. Saute the garlic and shallot until fragrant, about 3 – 5 minutes. 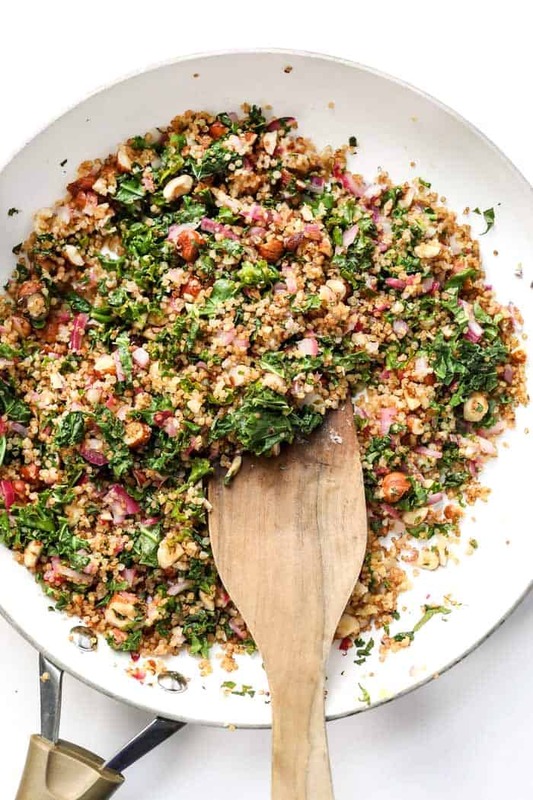 Add the cooked quinoa, hazelnuts and kale, drizzle with lemon juice to the pan and season with salt and pepper. Turn down to low and stir occasionally until the sweet potatoes are done. When the sweet potatoes are soft, remove them from the oven and let them cool for a few minutes. Once cooled, transfer them to a plate, split them open with a sharp knife and spoon the quinoa into the center. 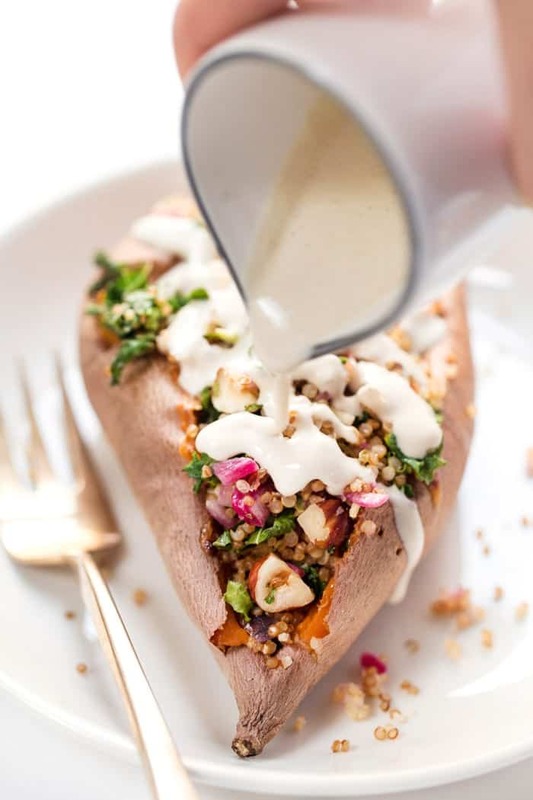 Whisk together the tahini dressing ingredients and pour on top of sweet potatoes. Serve immediately and enjoy! I love the recipe and I really appreciate the Nutritional information. but I would really like it if you made it easy to PRINT. I need a copy for my files. I am sure that YOU HAVE HAD THIS REQUEST BEFOREEEEEEE. It actually is easy to print 🙂 There’s a print button right below the star rating. If you’re on a desktop, it’s over in the right hand side, on mobile it’s near the stars. That should have everything you need! Making it right now for a snack. Next time will bake a sweet potato too. Calorie count seems high at 555 though. Made this for dinner last night – fantastic! Easy to make and very tasty. 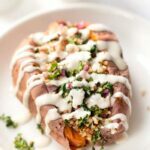 I have been looking to make stuffed sweet potatoes for some time, but I don’t know if they can be enjoyed as a snack. Any ideas? A quick question about the chopped kale as when it should be added seems to be omitted in the instructions. Do you sauté them with the garlic and shallots? Or just add the chopped kale uncooked when you stir in the quinoa? Thanks for catching that! Yes, the kale does get added right before the quinoa. Updating now! The recipe was not updated. 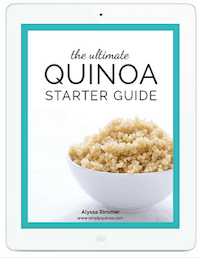 So looking forward to making this as I have enjoyed so many of your recipes and really like quinoa….have been working on getting more protein into my diet, thinking that might be some of my lack of energy and motivation. My friend and I too have been lacking motivation to exercise so we now are encouraging & challenging each other by meeting at a local church where we paid $3 (lol) a month to use their indoor walking track and any of their exercise equipment that we want. We don’t want the other to out do us, so it keeps us both going and we certainly feel better and enjoy the fellowship. I do know it is a decision we make and discipline in our life is not always easy but in our perserverance there is success. So be encouraged and persevere and thank you for sharing and encouraging us with these eating healthy recipes. I am in a bad slump to much sugar preservative from ham. I awake with a bad hive and . I will go back to my routine this morning. I also replace ingredient with quinoa. Oh my! 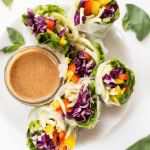 I just found this recipe and am in love just with the picture. Will definitely be making this as soon as I get all the ingredients! Thank you so much for this website. I am GF, as well as allergic to rice, corn, dairy, etc. I really loved the Quinoa Thins that I made today as well. Made this tonight — so good! I’ve been looking for hearty vegetarian meals to add to my dinner rotations. This one fit the bill perfectly! I’ve never cooked with hazelnuts before; they added such a great element to the meal. Thanks for the recipe!! This recipe was awesome ! Thank you for this idea, we enjoyed it very much. This looks absolutely fabulous and nourishing and yummy. Would you mind posting this to my food blog carnival, superfood sundays? It is geared toward helping new moms prepare for pregnancy and breastfeeding. I can’t help you with the motivation for excercise in Winter. I have the same problem. Just want to stay in my warm house all winter! Your recipe looks amazing! Love both sweet potatoes and quinoa but never thought to put the 2 together. This looks delicious! We eat sweet potatoes a lot and I usually don’t put anything but a little butter on them. I love this idea to spice it up! That actually sounds really good. I eat sweet potato all the time but usually just with butter and I always microwave them to save on time. As for motivation to work out, you gotta set a measurable goal so you have a reason to work out. I know what you mean about staying motivated, it can be so challenging sometimes. I live in the north and have a tendency to have symptoms of SAD so I use exercise to prevent and especially focus on how good I feel after. My mantra lately is I deserve to be happy and feel good and I always tell myself the bare minimum is go walk 30 minutes a day- just walking. Usually once I’m there though I get into it a little more. I have also checked out Pinterest for motivation pictures and new ideas. Hope this helps!